The Russian economy is encountering headwinds since the oil price declined and sanctions against the country were imposed. In this study we use correlation analysis to find out more about the relation between the oil price and country risk. As expected we find a significant positive relationship between the oil price and the economic part of the country risk measure. But no such significant relationship is found for the political and structural parts of country risk. The overall result is then that Russia’s overall country risk measure found not to be significantly correlated with the oil price. The Russian economy is in a recession. Russia’s GDP contracted by 3.7% in 2015 and is forecast to contract again this year. With oil and gas accounting for 70% of Russian exports, the recent oil price decline is one reason behind the economic turmoil. The sanctions imposed against Russia since Q1 of 2014 by, amongst others, the US, Canada, Australia and EU countries, is another one. For 2017, GDP recovery of 0.8% is expected as domestic demand slowly picks up. Over the medium term, however, Russia remains heavily dependent on oil and gas exports, making it vulnerable to fluctuations in the world oil price. Despite being the second-largest producer on the oil market with around 12% of world production, Russia is not a member of OPEC. Moreover, unlike Saudi Arabia, or the US shale producers, it is not able to act as a swing producer in the oil market. For such capability it would need to be able to adjust its production swiftly and without much cost. Therefore, the country is a price taker in the oil market. It is not hard to grasp that for a country so dependent on oil, the decline of the oil price since mid-2014 has had a profound effect on the economy. The two main channels through which it has had an effect are the current account and government finances. The fall in the oil price had a significant negative impact on export revenues. Russia’s total exports fell from US$ 523 billion in 2013 (average oil price US$ 103 per barrel) to US$ 341 billion in 2015 (US$ 52 per barrel). 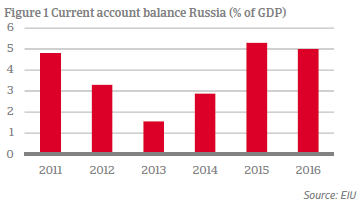 The deterioration of the current account that followed (Figure 1) put pressure on the Russian ruble, which declined from 32 US$/RBL on average in 2013 to 61 US$/RBL in 2015. As a result of the pressure on the exchange rate, the government was forced to let the ruble float freely by late 2014. After this event, the current account balance improved again, but it did so primarily via a decline in imports. The other main channel through which the oil price has an effect are government finances. With energy exports constituting such a large fraction of state revenues, the lower oil price has caused a substantial decline in government revenues. As a result, the government budget balance deteriorated from around -1.2% of GDP in 2013 to -3.5% in 2015 and it is forecasted to deteriorate further this year. This forces Russia to cut expenditures, such as social security, with an uncertain impact on (internal) security and defence (which are expected to remain relatively untouched). Financing the deficit primarily takes place by drawing on the Reserve Fund (5.8% of GDP) and the National Wealth Fund (6.5% of GDP). Russia’s access to international financial markets is severely restrained as a result of the international sanctions. Though external account and government finances are most directly affected, the low oil price ultimately has an impact on other sides of the economy as well. Business confidence is low because exports, government expenditures, and consumption are all under pressure. The Russian central bank fights inflation with interest rate hikes, which translate into higher funding costs for businesses. Moreover, non-performing loans (NPLs) in the banking sector reached 9.2% of total loans in Q1 2016, up from around 6% in 2013/2014. Credit growth to the corporate sector, especially the retail sector, and households remains depressed. We want to analyse the impact of the oil price decline on Russian country risk, which we define essentially as the risk of doing business in a country. To conduct this analysis, we need a measure that captures the economic forces described above, as well as political factors. Literature on the relationship between oil and country risk tends to focus on the political side – factors such as corruption and rent seeking. A number of studies find a positive relationship between oil and corruption. There is also evidence of a negative relationship between oil revenues and political rights and a positive correlation with civil liberties. The idea is that oil states repress political rights in order to prevent the masses from getting a share of the pie, but have to give civil liberties in return keep people satisfied. However, there are also studies that do not find any effect of natural resource abundance and the degree of corruption. One of the difficulties is that it is hard to prove causality between natural resources and the political climate based on regression techniques that primarily exploit variance between countries. There is a strong likelihood that the results generated by such approaches will be driven by omitted variables that are time-invariant and country specific. Empirical ‘proof’ of a causal relationship between natural resources and country risk should be treated with care. We use the Euromoney Country Risk (ECR) score to measure country risk. ECR provides an online rating community of economic and political experts. The overall ECR score provides a snapshot of country risk in a country on a 100 point scale, with 100 being nearly devoid of any risk, and 0 being completely exposed to every risk. The headline ECR score is built up of six categories (which in total consist of 18 subcomponents). Three of the categories are qualitative expert opinions on political risk (weighting 30%), economic performance (30%) and structural assessment (10%). The other three quantitative scores are debt indicators (10%), credit ratings (10%) and access to finance/capital markets (10%). An overview can be found in Appendix Table A1. We plot the development of the oil price and the ECR score in figure 2. Casual inspection suggests a correlation between the two (Figure 2). But one should be careful: closer look reveals that the relation is far from perfect. For example, when international sanctions were imposed against Russia in mid-2014 the CR score fell significantly as the oil price hardly budged. We use a dataset provided by Euromoney for the overall ECR score as well as scores for the different categories and subcomponents over the period 2011 Q1 - 2016 Q1 for Russia. Quarterly data are used. Oil prices are collected for the same period from IHS and are converted into real prices, with 2014 as a base year. Our dataset gives us 22 observations for the overall ECR score and its category scores. We are restricted to use correlation analysis to link the oil price to ECR scores. This is purely a function of data limitations. A regression of ECR on the oil price and controlling for relevant variables would have been better. But it turns out the regression coefficients are hard to interpret given the low number of observations. Correlation coefficients as such describe a two way relationship between variables, meaning that causality does not become evident from the coefficients themselves. However, Russia is a price taker in the world oil market. Therefore, if a significant correlation is found, there is a strong case to be made that the causality runs from the oil price to the ECR score. We are simply less concerned with the causality issue. Moreover, we address the underlying trend in the ECR scores and oil price that is observed in Figure 2 by taking first differences. It reduces the number of observations to 21, though. An assumption we make is that ECR scores are collected uniformly throughout each quarter. Based on the information provided by Euromoney, which stresses that the ECR scores provide a snapshot of a country’s current position, this seems a plausible assumption. We therefore also take the average oil price during each period. In an attempt to control for the sanctions against Russia that are in place since 2014 Q1, we have also calculated the correlations pre and post sanctions. The downside is that this further reduces the number of observations to 12 for the pre sanction period (2011 Q2 – 2014 Q1) and 9 for the post sanction period (2014 Q2 – 2016 Q2). Correlation coefficients between the oil price and the overall ECR score and the scores on the categories economic, political and structural are all found to be positive when looking at the full sample. Estimation results can be found in Table 1 for the three main categories underlying the ECR score: economic, political and structural risk. The correlation coefficient of the economic score is found to be significant, whereas the political and structural scores are not. This makes sense given that the negative effects from the low oil price on the Russian economy is obvious, whereas the empirical evidence on the effect of oil revenues on political and structural aspects of a country is less firm. The coefficient depicting the overall ECR score is driven into insignificance by the political and structural variables. 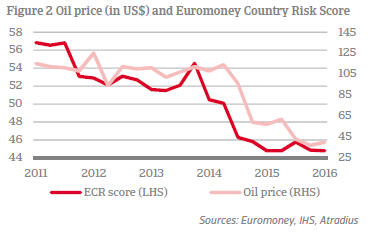 To grasp how sanctions against Russia have impacted the relationship between the oil price and ECR scores, we have also calculated the correlations before and after the sanctions. The results show the following. Firstly, all coefficients increase in size going from the pre to post sanction period. Secondly, as the economic correlation is only weakly significant in the pre sanction period, it has a stronger significance in the post sanction period. One is then inclined to conclude that this is indeed due to the sanctions being imposed. They stifle domestic and foreign investment and increase the reliance of the economy on oil. Additionally, the sanctions coincide with a drastic drop in the oil price. In a system based on expert judged it is not implausible that changes in the ECR ratings become more elastic to oil price changes as they become larger. Experts may simply act after the oil price change has surpassed a certain threshold. In such case, the increased significance is due to these two effects. Thirdly, the political and structural coefficients remain insignificant in both the pre and post sanction period. We have also looked at the correlations between the oil price and the subcomponents of each of the three categories as well as the quantitative measures (credit ratings, debt indicators, access to finance/capital markets). The results are shown in Appendix Table A2. The correlations of economic variables all have a positive sign over the full sample period and are all – except for government finances – found to be significant at the 5% level or higher. No significant relation is found between the oil price and political and structural variables – except for a weak negative relation with Information Access & Transparency. Other than some empirical studies (see literature overview), we find no relationship between the oil price and corruption. We also find no trace of an impact on government stability. It means that the Russian government retains a firm hold on power. And that such power is not markedly eroded by the oil price. Besides the subcomponents of the qualitative categories, we have also looked at the three quantitative variables. As expected the credit ratings show a (very) high correlation which is significant, but only weakly. The other quantitative variables display either no significant correlation with the oil price. Moving to the difference between pre and post sanction periods, the signs of the coefficients related to the economic variables are all positive, in line with our previous result. What really stands out is that four out of five economic variables are significant at 5% or higher in the post sanction period, whereas no or only weak significance can be found in the pre sanction period. As stressed before, this has to do with the simultaneous oil price drop and strong deterioration of the economic situation in Russia post Q1 2014. Looking at the political part of the ECR, Information Access & Transparency and Institutional Risk carry negative coefficients that are significant at the 5% level in the pre sanction period. In the post sanction period, the significance of both these variables disappears. This result is arguable in line with the empirical results of Aslaksen (2010), finding a negative relationship between oil revenues and political rights. The variables belonging to the structural part of the ECR are found to be insignificant for both the pre and post sanction period. One of our assumptions was that survey data on which the ECR scores are based were collected uniformly in each period. We therefore conducted our correlation analysis based on the country risk score as well as the average of the oil price from the same period. However, we cannot rule out the possibility that ECR survey data were mainly collected for instance in the month prior to quarter end instead of uniformly throughout the quarter. Therefore, we want to test whether the results hold if we take the average oil price from the third month of each quarter. The results from this sensitivity analysis indicate that this does not change the overall picture. Another assumption was that the oil price of the current period is the right unit of analysis for country risk. In other words, the underlying assumption is that experts who submit the ECR scores are not being influenced by oil price changes in previous quarters. To formally test whether this assumption is correct, we have also calculated correlations using a 1 quarter lagged oil price. According to the results, this leads to a disappearance of the significance of the economic coefficients, which means the 1 quarter lag in the oil price is not meaningful as an input. In this study we looked at the relationship between the oil price development and Russian country risk using correlation analysis. While our dataset is limited, we do find evidence that at least a strong correlation exists between economic parts of Russia’s country risk score and the oil price. No such significant relationship is found for political and structural variables that are also part of the overall country risk measure. The lack of significance on these parts makes the correlation between the overall country risk score and oil price insignificant. This does not mean that the oil price decline is not important, it simply does not carry enough weight on itself to significantly influence country risk, giving that the economic part of the overall risk score carries a weight of only 30%. Therefore, the oil price is only of limited relevance for Russian country risk. It hardly matters. That is our main result. What we have also found is that the correlations increase in size if we focus on the period after the sanctions against Russia were imposed. As this period coincides with a large drop in the oil price we argue that such may have triggered experts to adjust ECR rating changes that are otherwise not made.